Your pilgrimage begins as you depart the United States on your international flight. You will be welcomed to the Holy Land and be taken to your hotel in the Tel Aviv area. There you will have dinner and spend the night. You’ll begin your day with a drive along the coast of the Mediterranean Sea to Caesarea by the Sea. There you’ll see the Roman ruins of the great Theater and Aqueduct, as well as the Crusader city later built on this site. This is the place where Paul left for his final missionary journey. You’ll continue to Mt. Carmel where Elijah confronted the prophets of Baal and travel to Megiddo, also known as Armageddon. This is the place where Christians believe the final great battle of the world will be fought. You’ll travel to Nazareth where the angel appeared to Mary to announce that she would be the mother of God’s Son. This is also the place where Jesus spent his childhood years. From there you’ll drive through Cana where Jesus performed his first miracle and then proceed to Tiberias for dinner and your hotel for the night. 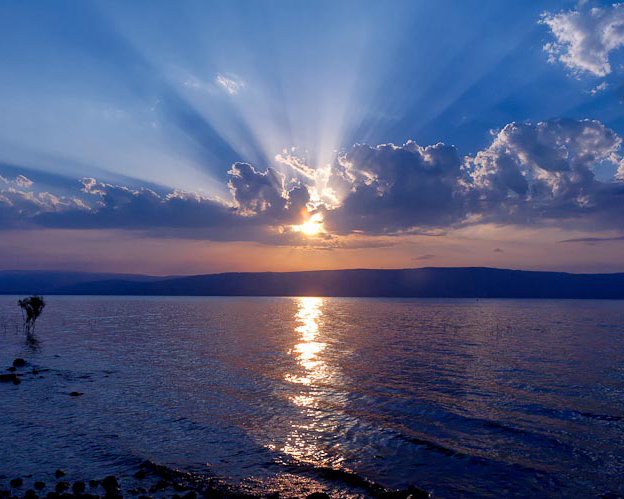 Today you’ll begin with a boat ride across the Sea of Galilee where you’ll stop for a devotional service. You’ll then visit Kibbutz Ginosar where you’ll see an ancient boat from the time of Jesus. You’ll continue to Caesarea Phillipi, at the foot of Mount Hermon, the ancient Roman city where Peter first confessed Jesus as the Christ. After your visit there you’ll go to the Road to Damascus where Paul had his conversion experience. You’ll continue your tour with a visit to the hills above the Sea where you find the Mount of Beatitudes. It was here that Jesus gave us the beautiful words from Matthew’s gospel. You’ll travel on to Tabgha, the site of the miracle of the multiplication of the loaves and fishes. We’ll end our day with a visit to Peter’s Primacy, a beautiful garden on the shores of the Sea of Galilee with a chapel commemorating the morning meal that Jesus prepared for the disciples after the resurrection. After your visit there you’ll return to for dinner and your hotel for the night. Today you’ll begin with a visit to Capernaum, the area where Jesus spent most of His ministry. After the visit here you’ll continue to Zippori, not far from Nazareth and a center of learning during the time of Jesus. You’ll see the beautiful mosaics and get a feel for the area where Jesus grew up. You’ll continue to BeitShe’an where you’ll visit the Roman ruins of the ancient Decapolis city which was continuously inhabited for 5000 years. You’ll end your day with a Baptism Service at the Jordan River before returning fordinner and your hotel for the night. This morning you’ll travel along the Jordan Valley on oyur way to Masada, the amazing mountaintop fortress built by Herod and site of the final battle in the Jewish Rebellion against the Romans. After your visit there, you’ll drive along the Dead Sea, passing the springs of Ein Gedion on your way to visit Qumran where the Dead Sea Scrolls were discovered. Afterward you’ll stop at the Dead Sea for an opportunity to float in that unique body of water over 1300 feet below sea level. You’ll finish your day with a drive through the Judean Wilderness on your way up to Jerusalem for dinner and your hotel for the night. 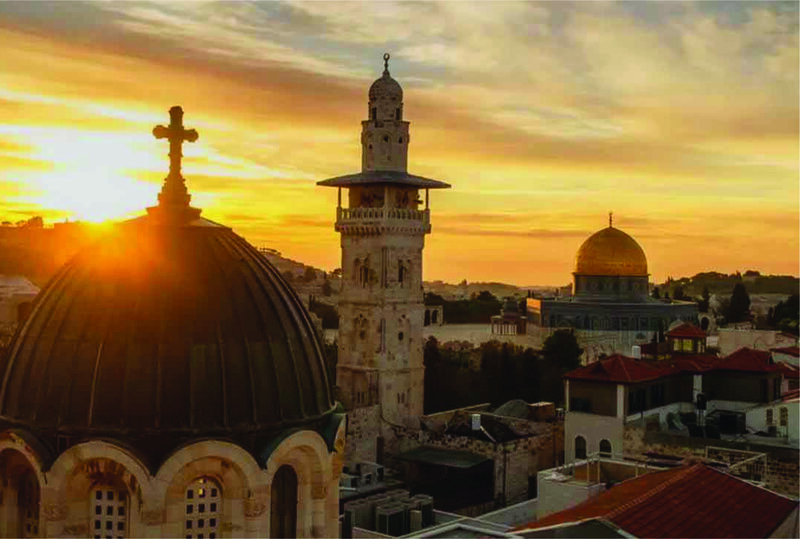 Today’s tour begins with a visit to the Mount of Olives where you’ll see a breathtaking Panoramic View of the Old City of Jerusalem. You’ll walk a part of the Palm Sunday Road to the Garden of Gethsemane where Jesus went with the disciples on the final night before his crucifixion. There you’ll visit the Church of All Nations and the garden with its ancient olive trees. Next you’ll go to Mount Zion where you’ll visit the Upper Room. From there you’ll go to the House of Caiaphas where Jesus was imprisoned for a night. You’ll finish the day with a visit to the Nativity Church in Bethlehem where you will visit the grotto, revered as the place where Jesus was born. From there you will go to dinner and your hotel for the night. 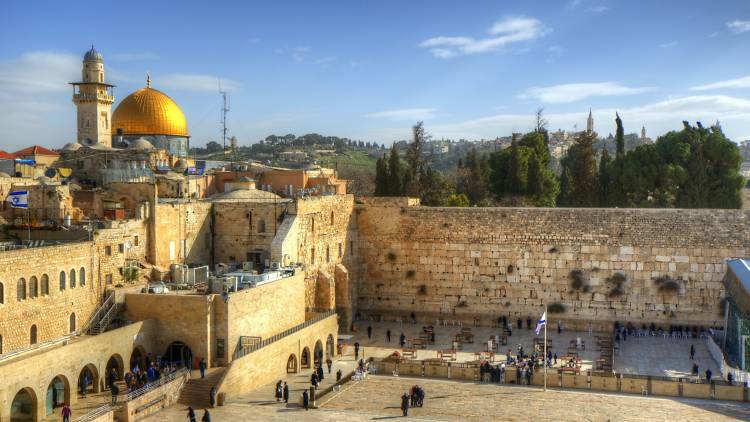 Your day will begin today with a visit to the Western Wall, the place most precious for Jews around the world. You’ll proceed to the Temple Mount where you’ll visit the Dome of the Rock Mosque. You’ll continue from there to the Pool of Bethesda where Jesus healed the crippled man. You’ll sing a hymn in the Church of St. Anne before you begin your walk down the Via Dolorosa, following the path Jesus took to the cross. You’ll visit the Church of the Holy Sepulcher and walk through the fascinating Arab market. You’ll tour through the Jewish Quarter where you’ll see the Roman Cardo and other sites of interest. At the end of your visit there, you’ll return for dinner and your hotel for the night. Today you will begin with a visit to Yad Vashem, the memorial to the Holocaust victims. Nearby, you’ll visit the Israel Museum which houses the Dead Sea Scrolls. From there you’ll be able to see the Israeli Knesset, seat of the Israeli Parliament and government offices. You’ll finish the day with a tour of the Model of First Century Jerusalem before returning for dinner and your hotel for the night. You’ll have an early breakfast before proceeding to the airport for your return flight to the United States. You’ll arrive home filled with new insights and understanding of the life and land of Jesus.